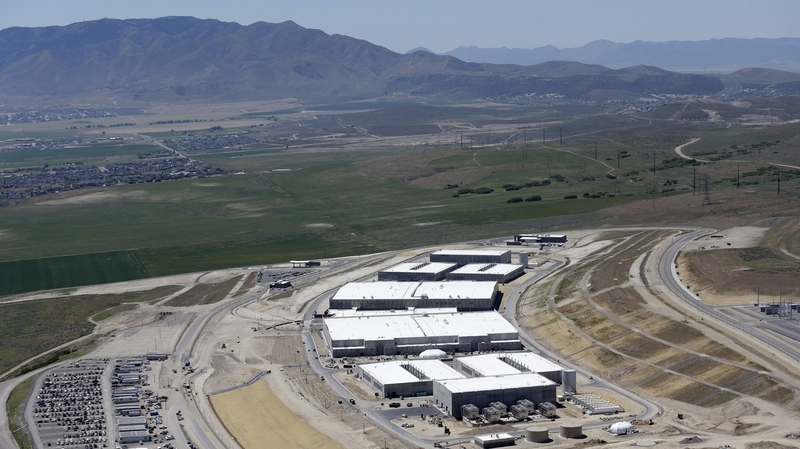 The National Security Agency says its massive new data center near Salt Lake City will enhance the agency's ability to analyze the email, text message, cellphone and landline metadata it collects. The National Security Agency won't say exactly when it will fully rev up its newest and biggest data farm in the Salt Lake City suburb of Bluffdale, Utah. There will be no "grand opening" or celebratory barbecue outside the sprawling facility, which is five times the size of the Ikea down the road. But, according to NSA spokeswoman Vanee' Vines, "We turn each machine on as it is installed, and the facility is ready for that installation to begin." Those machines are computer servers — enough to fill four warehouse-size "data halls" covering 100,000 square feet. NSA won't say how many servers are involved or reveal the data capacity of the $1.2 billion Utah Data Center. But running the complex requires 65 megawatts of electricity, enough to power about 65,000 homes. The electronics generate so much heat that they would fry without 1.5 million gallons of cooling water a day. More than 1 million additional square feet here are devoted to generators, diesel storage tanks, power substations, backup battery banks, water tanks, chilling plants and an office building. The annual maintenance costs are pegged at $20 million. "No Intent Here To Become Big Brother"
"We built it big because we could," says Lonny Anderson, the NSA's chief information officer, who runs the agency's data acquisition, storage and processing effort. "It's a state-of-the-art facility," Anderson adds. "It's the nicest data center in the U.S. government — maybe one of the nicest data centers there is." It also gives the federal government's intelligence agencies easier access to the email, text message, cellphone and landline metadata the NSA collects, "for foreign intelligence purpose[s]," as Vine insists. "They are looking for particular words, particular names, particular phrases or numbers ... information that's on their target list," says James Bamford, author of three books about the NSA and a 2012 Wired magazine article focused on the new data center. The NSA chose Bluffdale, Utah, as the site of the Utah Data Center for five basic attributes, according to Harvey Davis, the agency's director for logistics and installations. Power: "Utah was considerably cheaper" than any other candidate, Davis says, and supplies coal and hydrofueled power at one-quarter of the cost at existing installations. Space: A National Guard base, Camp Williams, had plenty of unused land. Security: The Camp Williams location and the area's open and treeless surroundings make the site relatively easy to secure and monitor. Logistics: The center is easy to supply, staff and maintain given its location in the midst of a metropolitan area of about 2 million people. Visiting NSA officials have easy access via Salt Lake City International Airport, which is just a half-hour away and is a major hub for Delta Airlines. Cooling: The cold winter climate and relatively low humidity help keep the buildings cool, though summer temperatures can top 100 degrees. Bluffdale officials say they can spare 1.5 million gallons of water a day for cooling. But Anderson asserts that there "is no intent here to become 'Big Brother.' ... There's no intent to watch American citizens," he says. "There is an attempt to ensure Americans are safe. And in some cases, the things you've read about the accesses we have [and] the capability we've developed are all about doing that." With the new center, that capability grows from smaller and dispersed centers in Hawaii, Colorado, Texas, Georgia and Maryland to an interconnected data cloud that is supposed to be both secure and exclusive to the U.S. Intelligence Community, the coalition of federal agencies responsible for foreign intelligence analysis. "In the past, for every particular activity you needed, you created a repository to store that data," Anderson explains. "And it was very purpose-built to do 'X,' whatever 'X' was. The cloud enables us to ... put that data together and make sense of it in a way that, in the past, we couldn't do." There's also a compliance component to NSA's cloud, Anderson says, in which the agency holds data — and restricts access — based on the requirements of federal law and the security clearances of the analysts seeking information. "As we ingest that data, we tag it in a certain way that ensures compliance," he says. Bamford says Utah's contribution to the cloud will basically provide storage and will be accessible via fiber-optic cables to much of the NSA's infrastructure around the world. In fact, NSA says the center will employ only 100 or so technicians to keep the infrastructure running. Intelligence analysts will log in remotely from NSA facilities in and outside the U.S.
"It'll function as ... NSA's external hard drive," Bamford adds. "The information is too voluminous and going by too fast, so one of the functions of Bluffdale will be to act sort of as a buffer." Encrypted information can be temporarily stored for days, weeks or longer, in case an encryption key is developed later. Information about known terrorist locations can be stored and tapped later if a sudden terrorist threat is detected. NSA's Anderson says the total size of the facility's data halls should not be used to calculate the storage capacity of the center, as some have tried to do. NSA whistle-blower William Binney has put the capacity at 5 zettabytes of data storage — the equivalent of 1.25 trillion DVDs, according to Cisco Systems. Other estimates have ranged as high as 1 yottabyte, or 250 trillion DVDs. 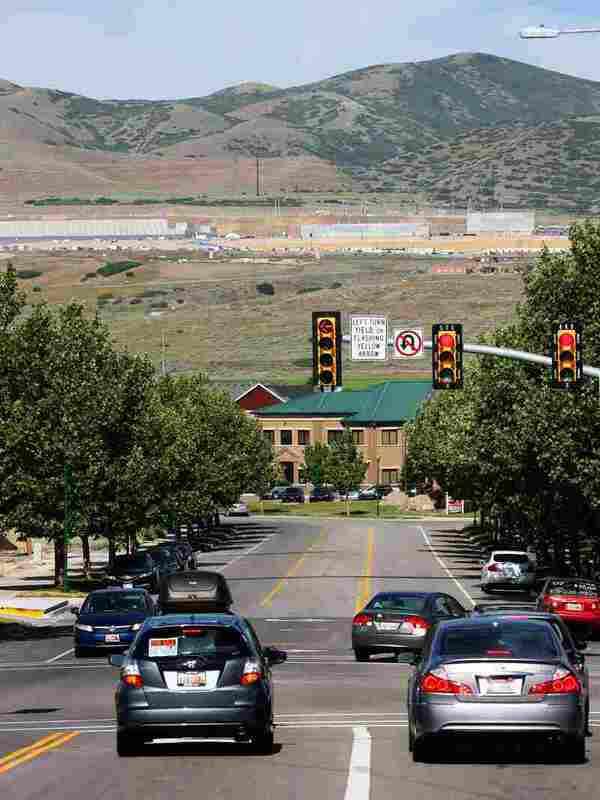 The NSA says the site's location near Salt Lake City will simplify staffing and the largely treeless surroundings will make the center relatively easy to secure and monitor. "It's hard to discern capacity from the outside looking in," notes Bamford, who also suggests state-of the-art data compression could give the NSA a greater amount of storage capacity than conventional measures indicate. The Utah Data Center was "built ... to last," Anderson says. "I've got new cryptologic centers in Georgia, Texas and Hawaii that are already undersized because we've outgrown them." The Utah facility also provides backup for NSA's other data centers. Anderson recalls a power outage in 2006, when data storage was concentrated at NSA headquarters outside Washington. "Basically, NSA went down for three days," he says. "The nation can't afford NSA to go down for three days. So we've spent an inordinate amount of time, effort and money to make sure that I've got redundancy in multiple power grids and multiple locations." NSA chose Utah for five basic attributes, ranging from the cost of power to the relative ease of securing the site, according to Harvey Davis, the agency's director for logistics and installations. And that security is tight. "We don't allow anyone on without the proper vetting and the proper business purpose," Davis told me, adding, with a smile, "You can't come in." But during construction last fall, NSA invited in local private data farm operators for limited tours, including Pete Ashdown of XMission, Utah's first Internet service provider. "You have to get through several layers of security to actually get back to where the computers and servers and systems would be operating," Ashdown recalls. "They steered around those. They wouldn't let us anywhere near them." During the tour, the NSA official guiding Ashdown mentioned another reason for the Utah location: the "patriotism" of Utahns. "That really rubbed me wrong," says Ashdown, a privacy advocate. "I believe that patriotism is questioning your government, questioning authority, making sure that the government stays in line, to preserve the government." This summer's revelations about the NSA's data-gathering practices and the leaks from former NSA contractor Edward Snowden prompted two relatively small protests — one at the data center site and one at the state capitol in Salt Lake City. "When the NSA executes broad surveillance on American citizens, they are harming my idea of this country," Ashdown told the crowd, estimated at about 25 people, according to The Salt Lake Tribune. Then, last month, The Wall Street Journal reported that Salt Lake City was a target of widespread NSA and FBI surveillance before and during the 2002 Winter Olympics. Unnamed officials told the Journal that the agencies had an arrangement with the local phone company, which "monitored the content of all email and text communications in the Salt Lake City area." State and Olympic officials reacted by saying they weren't aware of the surveillance but supported the notion, given that the Olympics were held just a few months after the Sept. 11 attacks. "The Olympics had been targeted by terrorists in the past," said Gary Herbert, Utah's Republican governor, at a news conference. "So I cut them a little slack in that regard." Any concern about NSA surveillance didn't affect Herbert's willingness to welcome the NSA's data center. "It's not the building. Having the facilities here is not the problem," Herbert said. "It's the people inside the building — those who run the NSA." NSA spokeswoman Vines would not comment on the Journal report but again emphasized that "NSA's collection activities always have a foreign intelligence purpose." Utah commuters and passing travelers have plenty of opportunity to think, worry or cheer about the NSA Data Center, if they care to. The entire complex is plainly visible from I-15 to the 145,000 people driving by every day.